These 2,400 jobs and thousands of indirect jobs are part of a network of five US manufacturers who produce the equipment used on projects in Egypt by Blumberg Grain, a global food security company. Blumberg Grain works primarily with emerging market governments to develop networks of food storage infrastructure that reduce post-harvest losses from more than 50% to less than 5%, says David Blumberg, company CEO for the Middle East and Africa, often doubling the nationwide output of locally harvested crops. After completion of Phase 1 of its project in Egypt, Blumberg Grain was assured it would be awarded Phase 2 by the minister of supply, Mr. Gordon said. At the ministry’s request, he said, the company and its suppliers produced design and engineering documents for Phase 2. “We ramped up our workforce and production lines and supplied the documents to the ministry in 2016,” Mr. Gordon said. While visiting Egypt five months ago, he said, one of the supplier teams learned that Egyptian government officials illegally provided their design and engineering documents to companies from other countries, putting these US manufacturing jobs at risk. “I was quite shocked and angry to see many of our designs for pits, scale, flow, etc., which were agreed as confidential and proprietary between Blumberg Grain and Egypt, were provided to Melinvest, a Russian company,” said John Crawford of Ag Growth International (AGI), whose main plants are in Kansas and Nebraska. With the promised second phase of the project not forthcoming, the US supplier network is weeks away from having to lay off several thousand highly skilled American craftsmen, Mr. Gordon said. “President Trump has said that recipients of American foreign aid will be expected to support US. jobs. How then can Egypt, who receives over $1 billion in US aid annually, not support American workers and businesses who pay the taxes that fund their aid?” he asked. Blumberg Grain has received strong bipartisan support from 38 US senators and representatives, Mr. Gordon said. Two years ago Blumberg Grain told Miami Today that it had struck an agreement to contract with Egypt for monumental projects in developing one of the world’s largest food security systems to help the governments improve citizens’ food access. The company’s sophisticated digital platform was to create control centers to oversee every facet of grain storage that now takes place in open-air sites that are often built of sand and dirt. 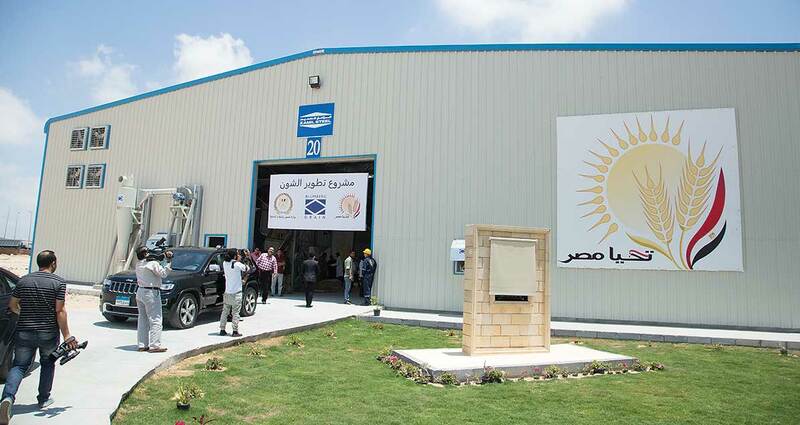 The company had agreed to Egypt’s aims to upgrade their food preservation systems with modernized technology. These projects would help not only provide food but also reduce waste and post-harvest losses of grain, especially wheat, where globally nearly 60% is lost due to outdated storage that exposes food to rot. As contract negotiations were ongoing, the total costs were not disclosed. The Blumberg Grain technology that was to be brought to Egypt consisted of the highest levels of grain conditioning, inventory management, grating, access management, security management and a slew of other enhanced features to create ideal conditions for grain handling and storage, said Mr. Blumberg. At that point, Egypt was storing wheat in open-air storage facilities called shounas, which Mr. Blumberg said consisted of sand and dirt. This was Blumberg Grain’s main focus. The article is very controversial since Blumberg Grain published a statement in October of last year thanking the Egyptian Government for payment completion. Details in the link below.